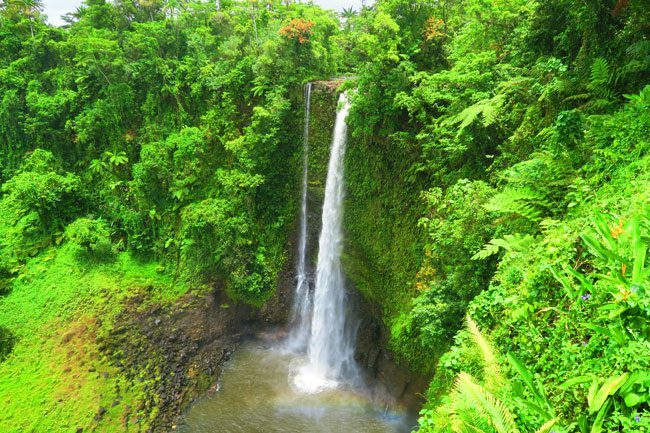 Welcome to beautiful Samoa, not only one of the most interesting tropical destinations you’ll ever visit, but also one of the prettiest. 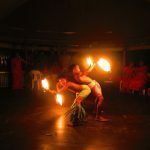 I spent nearly a month in Samoa while backpacking across the South Pacific Islands. 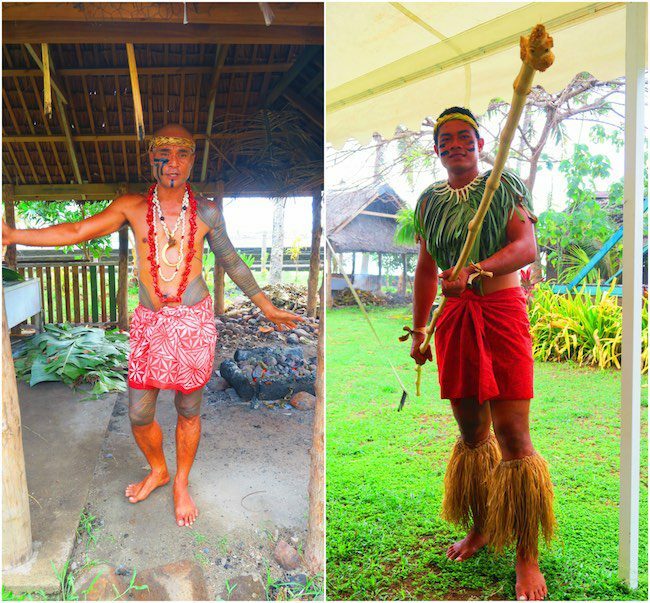 Here’s a 5 days in Samoa sample itinerary that focuses entirely on Upolu Island. 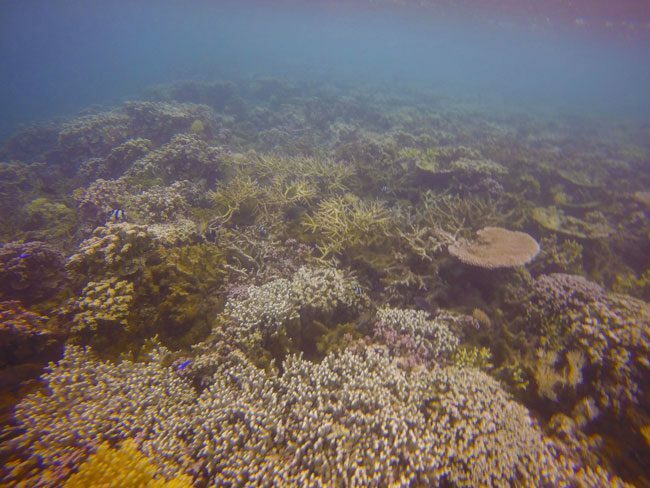 In such a short vacation, I wouldn’t recommend trying to squeeze in Savaii as well. 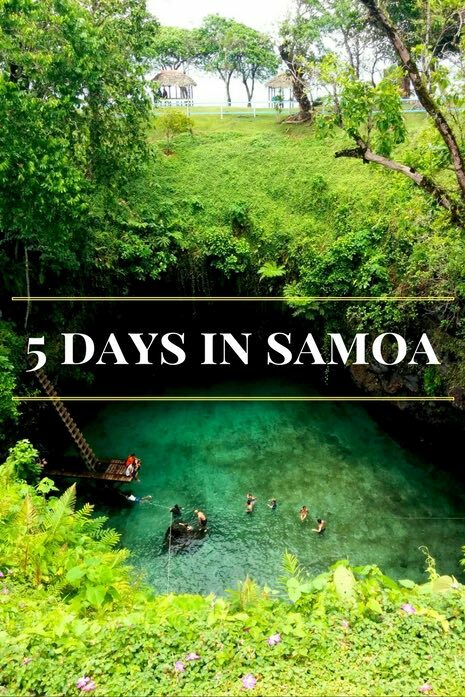 Before we begin, since you’re only spending 5 days in Samoa, it’s worth renting a car starting from day 2. 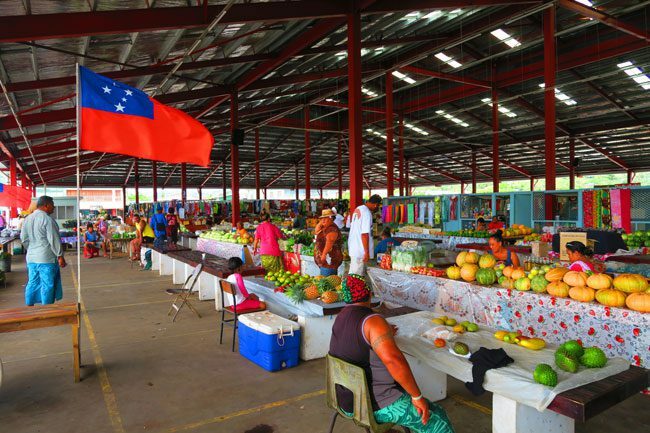 With prices starting at T120 per day (discounts for long rentals are possible), AA Rentals will drop the car off at your Apia hotel. 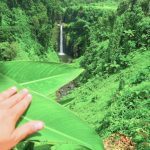 You totally can use a bus to get around Samoa, but it will be difficult to see everything mentioned in this sample itinerary within the allotted time. 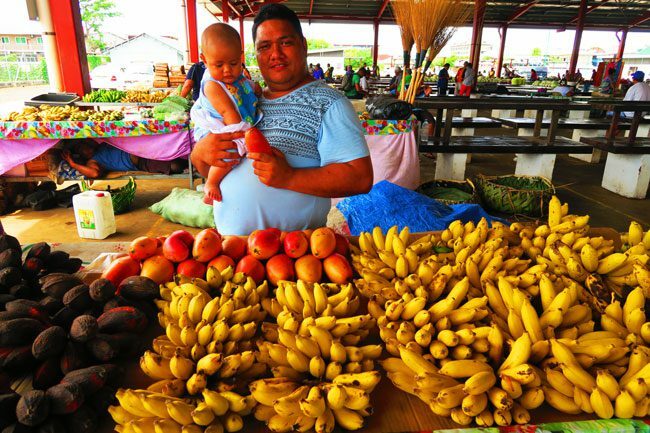 Also note the entrance fees at almost every stop, a normal occurrence in Samoa as most land is historically owned by villages. 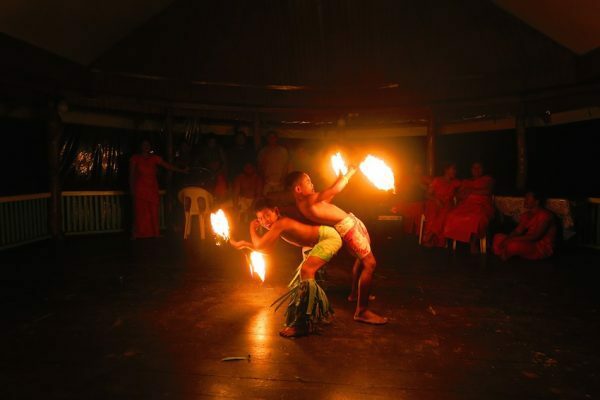 Lastly, if you’re staying at beach fale accommodations, breakfast and dinner are almost always included in the price. I loved the centrally located Talofa Inn so much, that I stayed here on two separate occasions. This bed and breakfast offers clean and air conditioned rooms, a tropical breakfast and it really feels like your home away from home. Here’s a full review of the Talofa Inn and other recommended accommodations in Upolu. 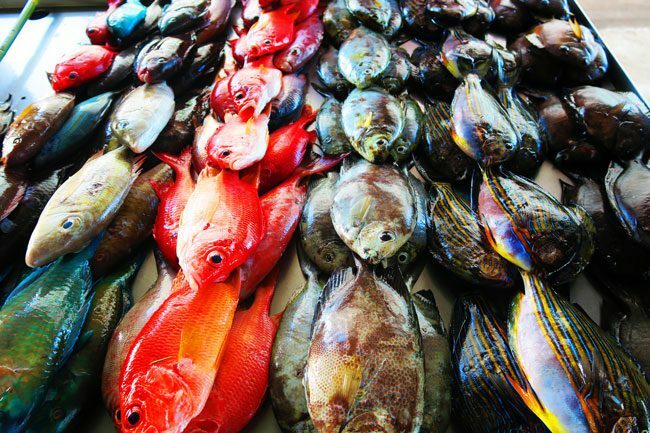 Start your first day in Samoa down by the waterfront at the fish market. 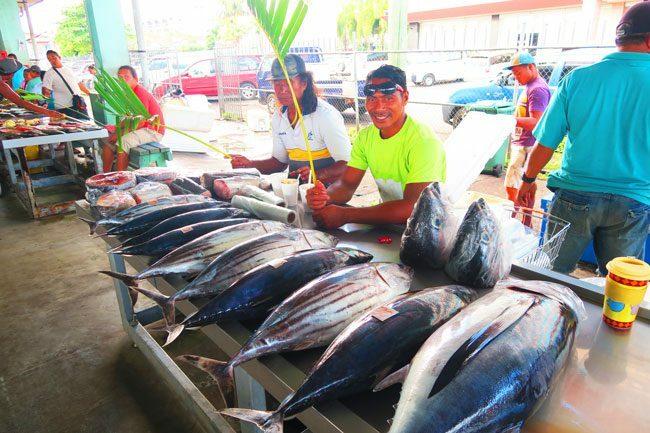 For the best experience, aim to arrive early in the morning to watch the fishermen unload the nightly catch of yellowtail tuna, lobsters and crabs. 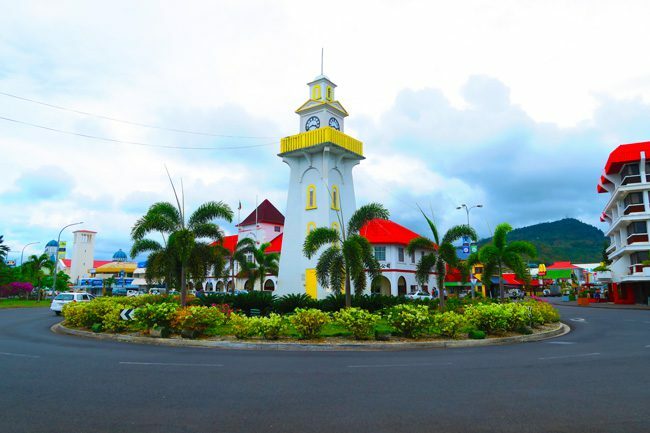 From the fish market, walk to the Mulivai Catholic Cathedral via the clock tower at the bottom of Vaiea Street (also known as the WWII memorial). Position yourself in front of the cathedral just before 9am, this is very important! 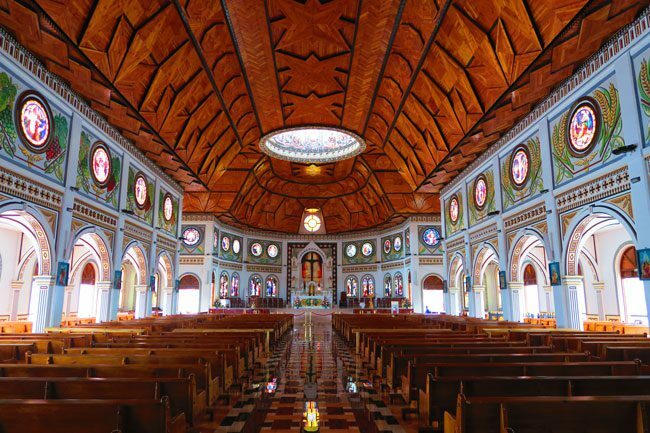 When the show wraps up, enter the cathedral and wander around its impressive interior. If you just happen to be in Apia on a Sunday, I highly recommend joining morning service whether you’re a believer or not. 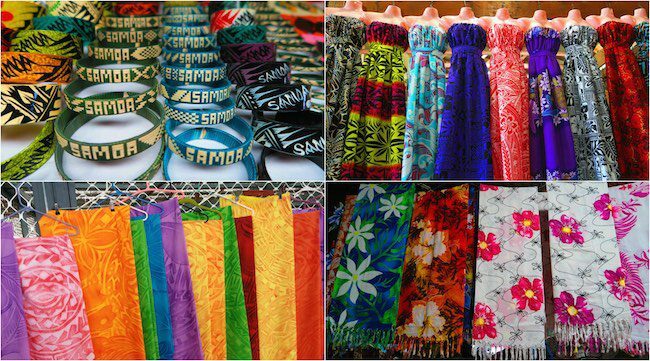 The attire, the singing and the strong sense of community are a souvenir of Samoa to take back with you for eternity. The tour will take you through various stations such as: traditional food preparation in an earth oven (umu), an ava (kava) ceremony, a beautiful dance show, tattoo, woodworking and siapo making (tapa cloth). 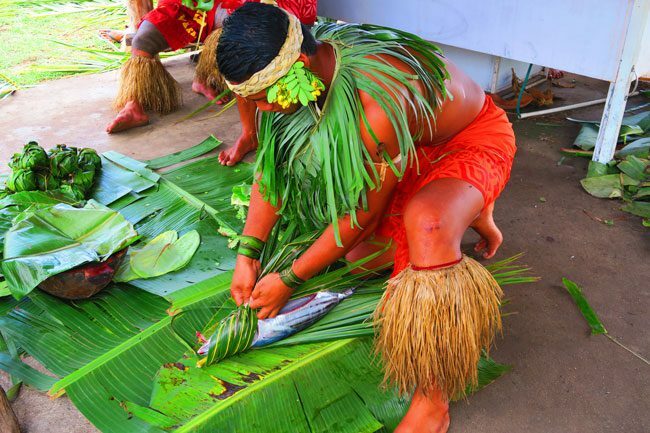 Along the way, you’ll learn about fa’a Samoa – the Samoan way. 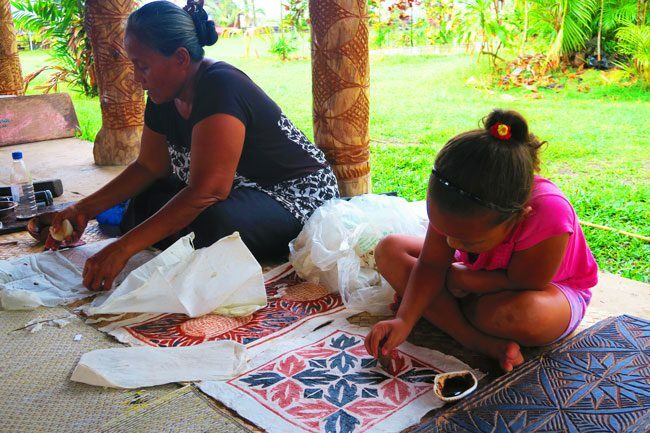 This traditional code of behavior and social structure is the backbone of Samoan society. 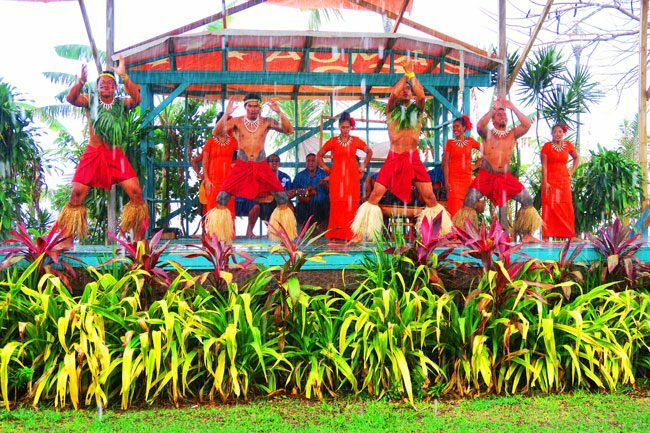 The informative and interactive tour will put the rest of your visit to Samoa in the right context. 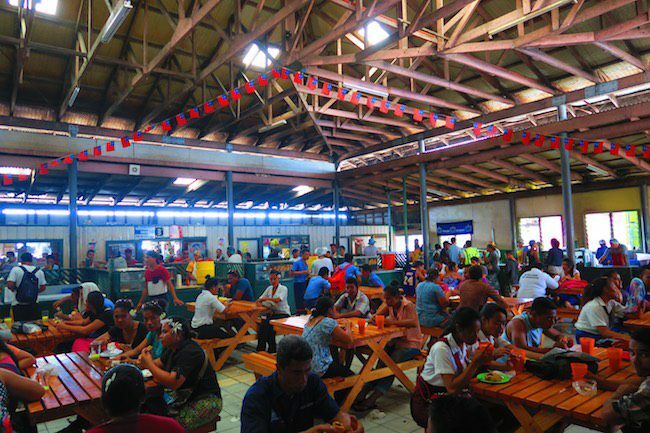 Lunch is included and you can purchase Samoan art directly from the artists at bargain rates. The last highlight of the day is in the outskirts of town but I guarantee you’ll love it… that is if you feel like getting wet. Take a taxi or bus to the Papaseea Sliding Rocks (T20 entrance). 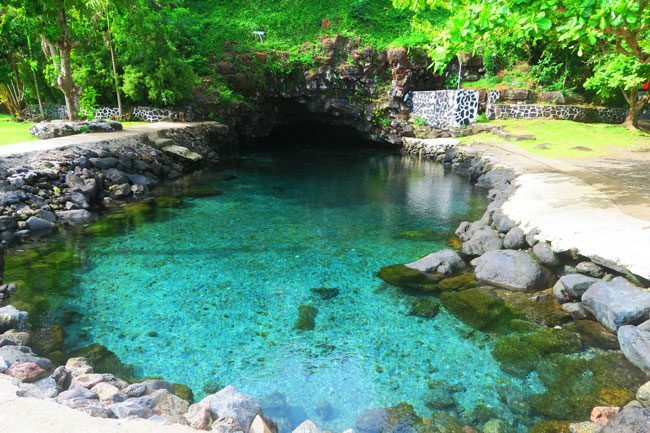 As its name suggests, the purpose of your visit is to slide down the smooth volcanic rock down to the pool. Just check water levels before sliding down, as it can be a bumpy landing in the dry season. Alternatively, you can walk along Beach Road for awesome views of Apia. 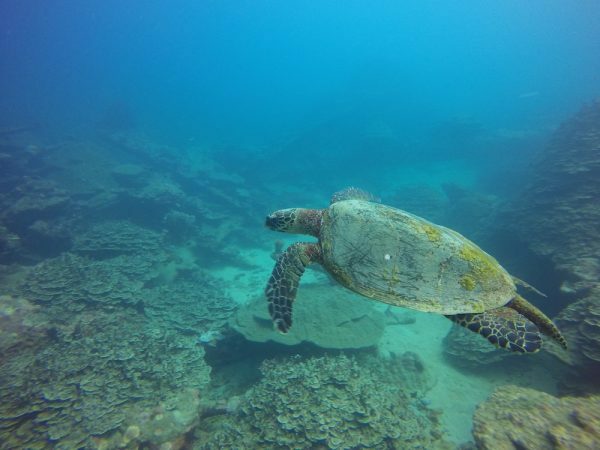 The road will eventually lead to the Palolo Deep Marine Reserve where the best snorkeling in Samoa can be found. In any case, the road is also where you’ll find the Seafood Gourmet Bar & Grill and Cocktails On The Rocks, great options for dinner and drinks. 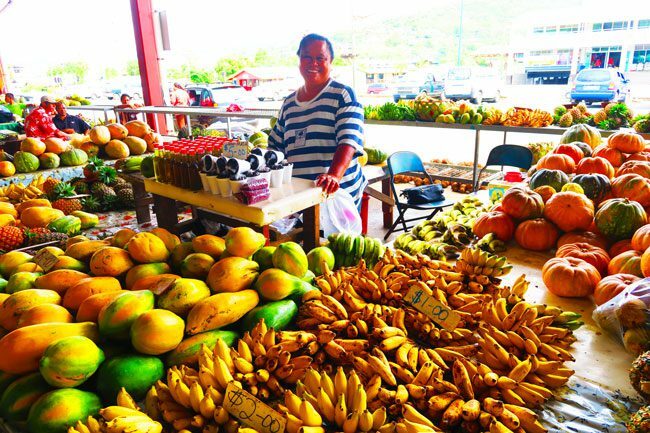 Check out of your Apia hotel and embark on a small island road trip. 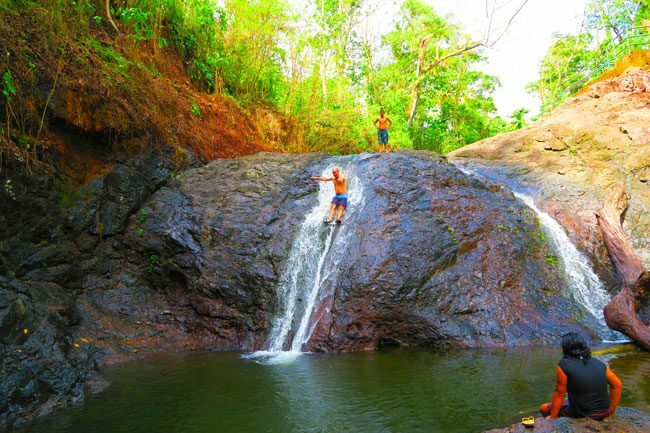 Today will take you to natural pools and waterfalls in Upolu before checking into your beach fale accommodation right on the beach. 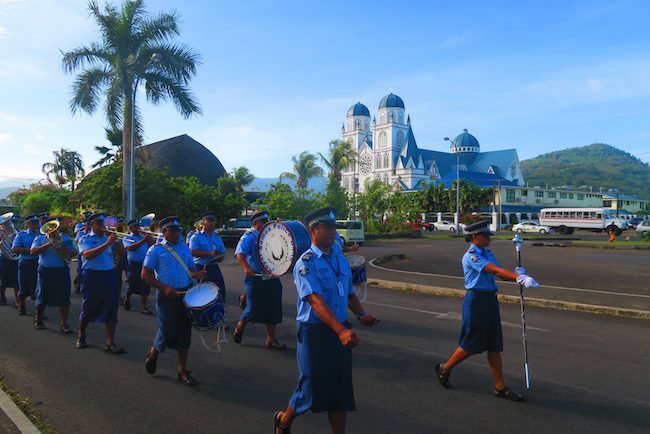 Getting out of Apia, drive on the Main East Coast Road to the Piula Cave Pool (T5 entrance). The road actually runs along the north coast of the island so the name is a bit confusing, I admit. Aim to reach the cave pool early in the morning before 10am. Why? The incredibly transparent water of this pool will be fully appreciated when there’s nobody else around. The natural pool is fed by water trickling from the highlands and its residents include weird looking silver fish and even eel. 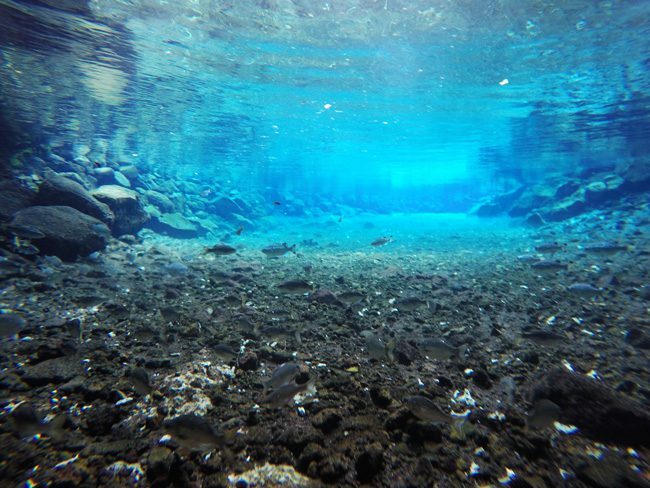 Here’s what it feels like swimming in the Piula Cave Pool. Pure magic! The coastal road then turns into the Richardson Road, eventually leading to the Le Mafa Pass. 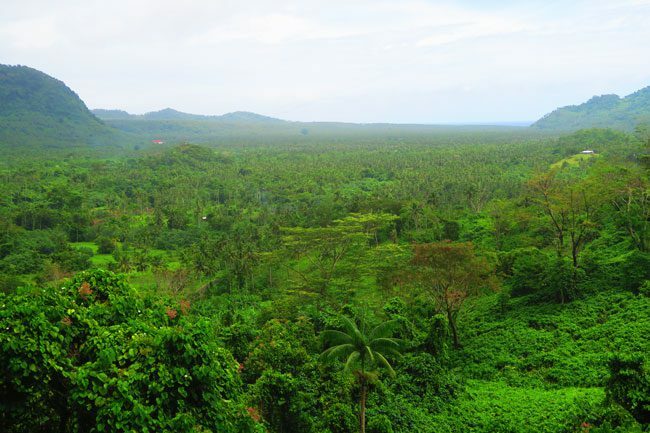 This scenic road cuts through the mountains and offers sensational views of a lush valley that meets the blue ocean. 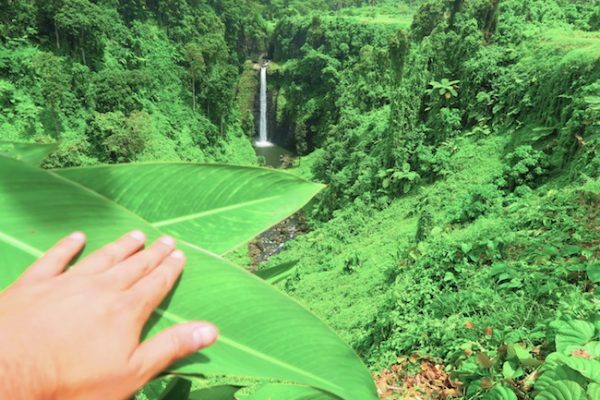 On a clear day, it’s that ‘classic’ tropical island view you had in your mind when booking the trip to Samoa. Continue on the Le Mafa Pass road to the Fuipisia Waterfall (T7 entrance). 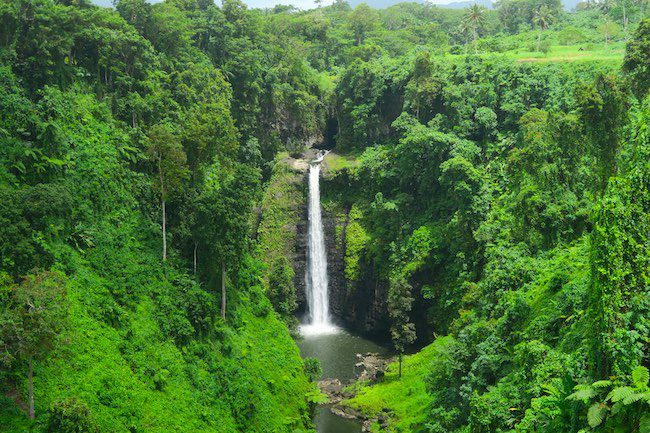 Park the car and walk along the trail that eventually leads to the very top of this 55 meter high waterfall. The views from up here are scary and exhilarating, offering a close look nature’s awesome forces at work. 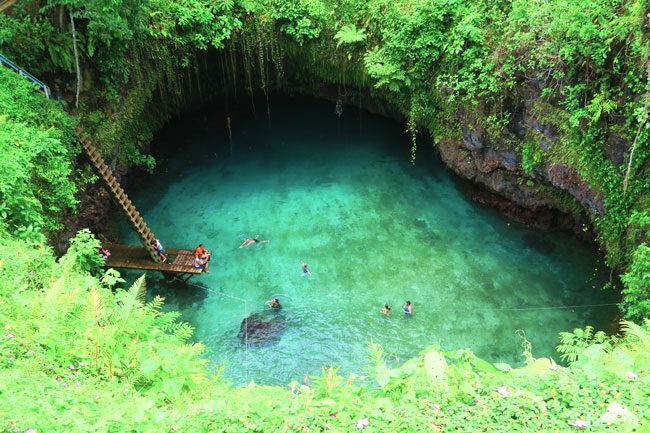 Out of a seemingly flat grassy surface, two sinkholes are connected by a lava tube, one of which is filled with aqua blue waters delivered straight from the nearby ocean. Bravely step down the ladder and float for as long as you want in this magical swimming pool. When you’ve had your swim, climb back up and walk down the path to the tide pools. There are awesome views of the rugged coastline from here and back up at the top, you can enjoy a picnic lunch (just bring your own). 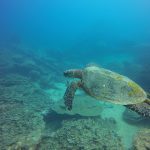 Back in the car, it’s a quick drive to Lalomanu Beach, where you’ll either check into the backpacker friendly Taufua Beach Fales or the more upmarket Litia Sini’s Beach Fales. 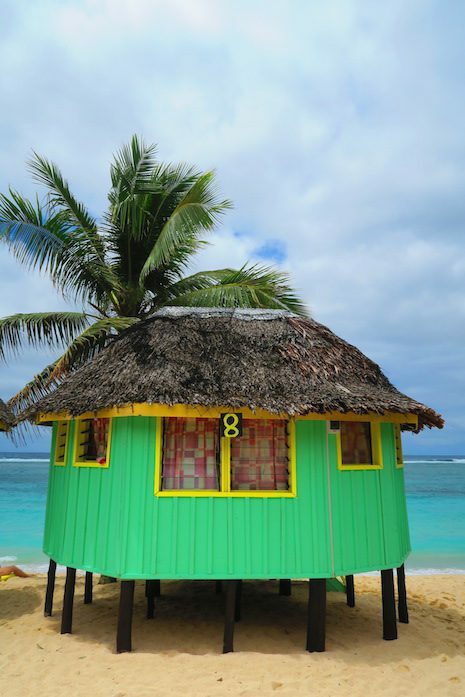 These charming beach huts are literally right on the beach and with breakfast and dinner included in the price – this is quite a bargain. 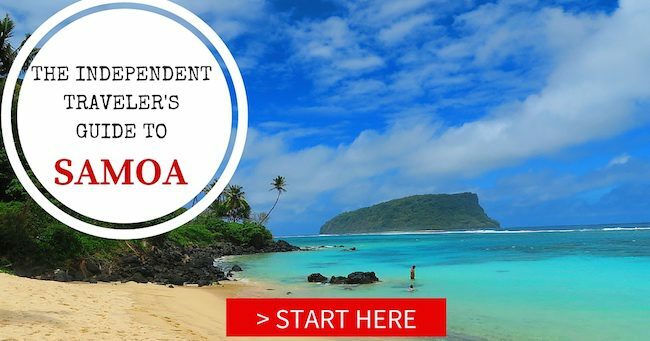 Both options are reviewed in this article in greater detail. 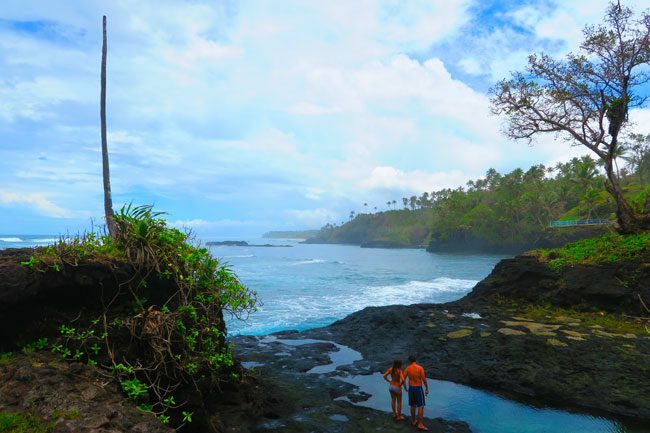 Lalomanu Beach is super popular with visitors to Samoa and for a good reason. 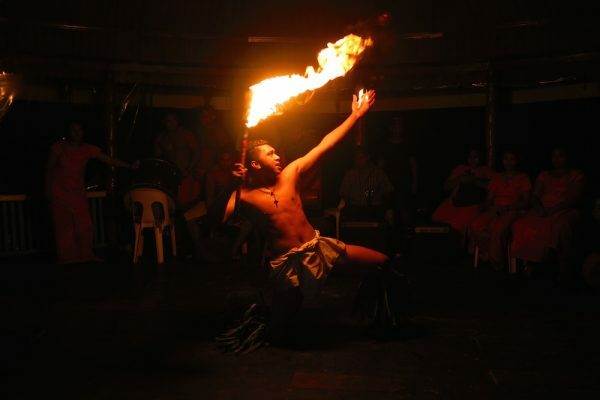 On Wednesdays and Saturdays, Taufua Beach Fales hosts a Polynesian dance and fire show that’s not to be missed (donations expected). 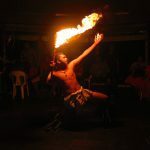 Here’s what the dancing looks like and here’s a glimpse of the amazing fire show.